I have read many books on the subject of mindfulness and in particular with regards to teens. 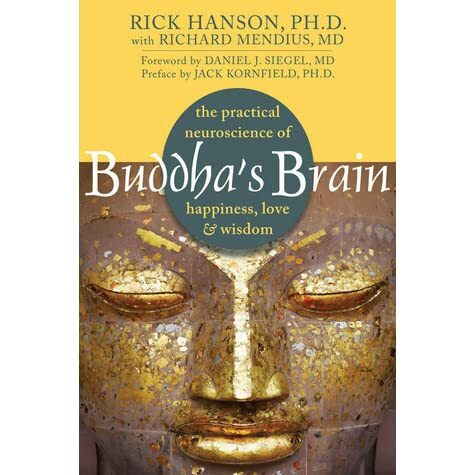 Since becoming a yoga teacher, the one I return to time and time again for guidance is Buddha's Brain, by Rick Hanson, with Richard Mendius. Yes, there is discussion of Buddhism and its principles, but the message I took away was that when we change our brain we can positively change our life. I find this concept particularly helpful when working with teens, helping them to develop strategies for positive thinking and stress reduction. There are countless books that tell us by altering our thinking and our actions we can be happier and more fulfilled. Buddha’s Brain makes it practical. Hanson outlines effective methods, including useful exercises and meditations, to help us live fully present in the moment which can ultimately help us to develop a more loving, happier, and wiser state of being. The methods suggested are informed by Buddhist teachings on mindfulness, virtue, and wisdom. The book is divided into four parts: suffering, happiness, love and wisdom. Hanson and Mendius end each chapter summarizing key points, making the book a quick "go to" reference for ideas to share which I find to be an extremely helpful resource in teaching teens. Young people today are living in increasingly competitive environments during their formative years. Positive thinking strategies and calming techniques are like food to nourish them and help them grow and flourish. Having and practicing these skills is literally FOOD FOR THE SOUL! "Compassion widens the circle of ‘us’ while assertion protects and supports everyone inside it." No matter the circumstances, if we live this idea consistently, we inevitably create our own supportive circle while holding up and supporting others within it. Of course, this also breeds connection and while calming the nervous system…again, literal ‘food’ for the typically anxious adolescent. When having this conversation, I get many positive reactions and some challenges from the teens. Some ask, "But, how do I win then?" I ask them to create a Venn Diagram and carry it with them in their back pack as a reminder to live with compassion and assertion. I challenge them try it for a month. “If you live in a wide circle and offer support as a habit, notice how you feel. When you go through life this way, it's not possible to ‘lose’ because you are living in peace." Aha, a new perspective for teens…and adults, too! My class is often silent in reflection after this conversation, so I like to include plenty of reflection and writing time as part of the lesson. I also keep extra copies of the book in case my students wish to borrow it and read more. My personal copy of this book is well-loved, to say the least. It has many pages with highlights and handwritten notes which I refer to often. It is an easy read and is humorous. I highly recommend reading it for yourself and as support for your work with teens! Ann will be teaching a ChildLight Yoga & Mindfulness for Children Teacher Training in Dover, NH this October 20-22 as well as Yoga & Mindfulness for Tweens & Teens in Hartford, CT this November 18-19. She will also be presenting for the 2nd time at the National Kids Yoga Conference in Washington D.C. this October. Her session will be a teen yoga class: "Developing Your Eagle Eye." Ann Biese, RYT 500, E-RYT 200, is an international Yoga Instructor and Teacher Trainer for ChildLight Yoga. Ann enjoys volunteering as an instructor for Go Give Yoga in Haiti as well as in Boston area homeless shelters. She was featured in North Shore Magazine for her work in Massachusetts...(continue reading here).